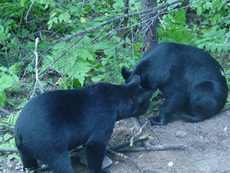 Larsson's Camp is located in one of the most productive and healthy black bear regions in N.W. Ontario. 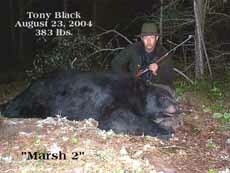 We operate two good sized bear management areas in this region, and our hunts are tremendously successful. 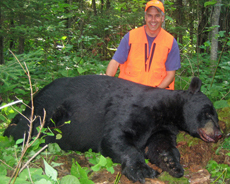 Each guest usually sees numerous bears during his or her week long hunt, and generally has more than one opportunity to harvest a great looking bear. 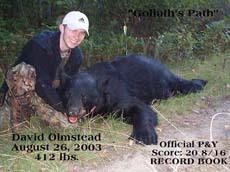 Many of our guests have harvested record book bears, although many of them have not been officially scored or entered into the books. 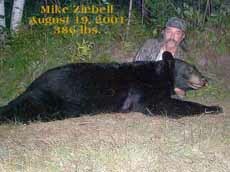 We take your bear hunt very seriously, and do the majority of the work before the season even begins. 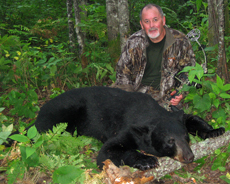 While the bear season in this region runs from August 15th through October 31st each year, we only accept bear hunters during the last two weeks of August and the first two weeks of September, as these are the very best weeks to hunt. 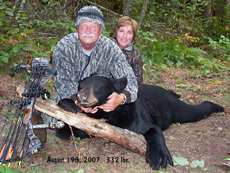 Hunts are conducted over bait which has been formulated by us not only to attract and keep the bears interested, but also to provide them with excellent nutritional value. This ensures that they will continue to return to the bait sites after their first visit, as bears instinctively know what food sources provide them with their best means of bulking up for the approaching winter months. We present this bait to the bears in small amounts on a daily basis, which ensures a higher level of competition between bears over the bait. This in turn increases the likelihood that the bears will visit the bait sites more often, and during legal daylight shooting hours. 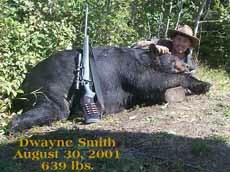 We begin baiting well in advance of the actual hunting season, and we shut down and do not use any bait sites that are not being hit consistently, or are dominated by a sow with her cubs. 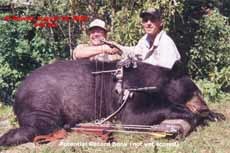 In this way you are assured the best chance for a quality hunting opportunity. Your hunt is a full service package that includes: private accommodations for your group (in one of our lakeshore cabins or our motel unit); three meals daily in our on-site restaurant, the Caliper Cove Bar & Grill (a bag lunch is prepared for those that prefer to remain in the field all day); full guide service; and a boat and motor package in case you harvest your bear early and want to try a little fishing. The week begins with a guided tour of our bait sites as you join us on one of our daily baiting loops. Then, on the evening of your arrival, you join us for our "bear school", as we discuss hunting tactics, shot placement, and tips for judging bear size. Finally we put your new knowledge to the test as we give you the opportunity to judge shots and bears in several hours of bear video taken by ourselves and our guests. Your guides are also the owners of the business, which means they have the greatest interest in your satisfaction and success. Each of your guides has himself been a hunter for many years, so their philosophy is simple: "Treat the guest the way we would want to be treated if we were on a guided hunt". 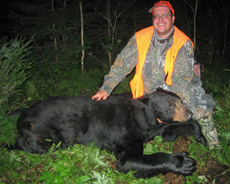 Your guides are available to assist you in every capacity of your hunt, including site selection and setup, tracking your bear and transporting it back to camp, and taking a complimentary digital photograph of you with your bear in the field. 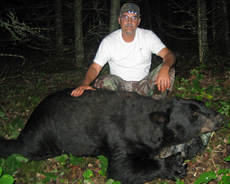 Back at camp, we weigh your bear using our commercial quality digital scale, and record all the information about the bear that will be needed by you and your taxidermist, the Ontario Ministry of Natural Resources biologists, and the Customs Officials on your trip back home. Finally, we remove the hide of the bear in a manner best suited for the way in which you intend to have the bear mounted; live mount or rug. We then roll the hide, package it, and freeze it for your trip home. Please note that taxidermy is your responsibility and is NOT part of the bear hunt package. Time and weather permitting, we transport the bear carcass the nearest butcher that handles wild game, about a half an hour away. They cut and wrap the meat according to your specifications. 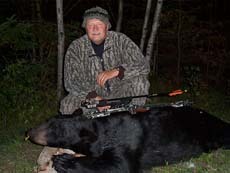 This is part of your bear hunt package. However, if temperatures are too warm and threaten to spoil the meat, or you are departing for home on the same or next day, we simply quarter the bear in camp, and freeze the meat as quickly as possible. Before your trip home we ensure you have all the proper paperwork to transport your bear out of Ontario legally, and to make your border crossing experience as smooth as possible. As owners, our commitment is to your satisfaction and success, within a framework of safety, adherence to the law, good sportsmanship, and an ethical hunt. We are confident that your hunting vacation at Larsson's Camp will be one that you remember fondly for many, many years to come. 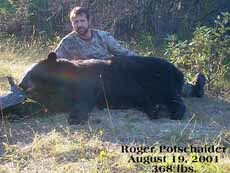 Season Dates: We conduct our bear hunts during the last two weeks of August and the first two weeks of September. Six full days of hunting (a seven night stay). Private accommodations for your group (cabin or motel unit). 3 complete meals daily In the Caliper Cove Bar & Grill. A bag lunch is provided for those that prefer to remain in the field. Multiple active bait sites for each hunter. Comfortable ladder type stand at each site to be hunted. Tracking and retrieval of game and transportation back to camp. Hide removal and freezing of hide for transport home (NOT taxidermy). Processing of your meat by a local butcher, or quartering and freezing of carcass for transport home (if time or temperatures do not allow for processing by butcher). A boat and motor for fishing Caliper Lake if you harvest your bear early. Hours and hours of story swapping and joke telling. Hunters are free to build their own package from the options below. 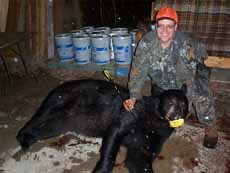 Note: for safety reasons hunters are required to return to camp after shooting at an animal. Tracking is done by our staff, without exception. 50% of the hunt package price is due at the time of booking. The remaining 50% of the hunt package price as well as taxes and balance due to exchange, if any, are due upon completion of the hunt. All deposits are converted to CDN$ using the exchange rate current at time of receipt. On completion of the hunt the hunt cost is converted to CDN$ using the current exchange rate and taxes are calculated on that amount. Payments may be made in CDN or US funds. Fair exchange is given based on the current rate. 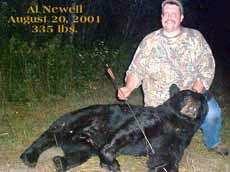 All monies paid toward guided hunts are non-transferable and non-refundable. IMPORTANT: You must bring a hunting license in your name from your home state in order to purchase an Ontario hunting license. The license should be an old one that you no longer require, as you will need to surrender it to the issuer here. It must be an original license (no photocopies). If you do not bring this license, you will NOT be able to purchase your black bear license here. 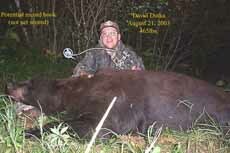 IMPORTANT: We do not recommend mechanical broadheads for bear hunting. If you will be hunting with bow we require you to use fixed blade broadheads. *PLEASE CONTACT US WELL BEFORE YOUR HUNT OR CLICK ON OUR LINK TO THE MINISTRY OF NATURAL RESOURCES WEB SITE TO ENSURE YOU BECOME FAMILIAR WITH CANADIAN HUNTING LAWS. THIS IS YOUR RESPONSIBILITY.